Oregon Chocolate Festival in 2020! Charlie Douglass got his start in the world of confections and chocolate at the age of 9, working in his family’s candy shop on the boardwalk in Wildwood, NJ. Growing up in the candy business, he had the good fortune to apprentice with master confectioner Christian Steiner. Later, looking to expand his knowledge, he took a job with Disney World, as assistant manager in their candy operation. There he learned the A to Z of hard candy, making the large souvenir lollipops sold in the park. Moving west in the 70’s, he started a career at Harry and David, working in all aspects of fruit preserves, sauces, vinegars and sweet pickles. Always looking to get back to his chocolate roots, he moved into managing their candy operation. During this time, he was able to create new candies and play with flavors, this was where he wanted to be and eventually, he became the company Chocolatier and Research and Development Manager. 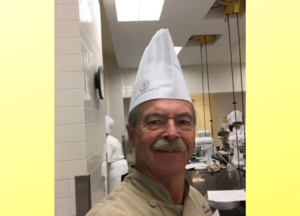 During this time, Charlie was able to study with many teachers and attend numerous seminars and classes, including the Gus Palakos Candy School and the French Pastry School. The Oregon Chocolate Festival is partnered with the Children’s Miracle Network and will provide 10% of the festival ticket proceeds in 2019 to the Asante’s Neonatal Intensive Care Unit (NICU) located at the Asante Rogue Regional Medical Center. Helping premature babies thrive! 10% of festival ticket sales support NICU. 10% of Charlie's Chocolate Run ticket sales support NICU..